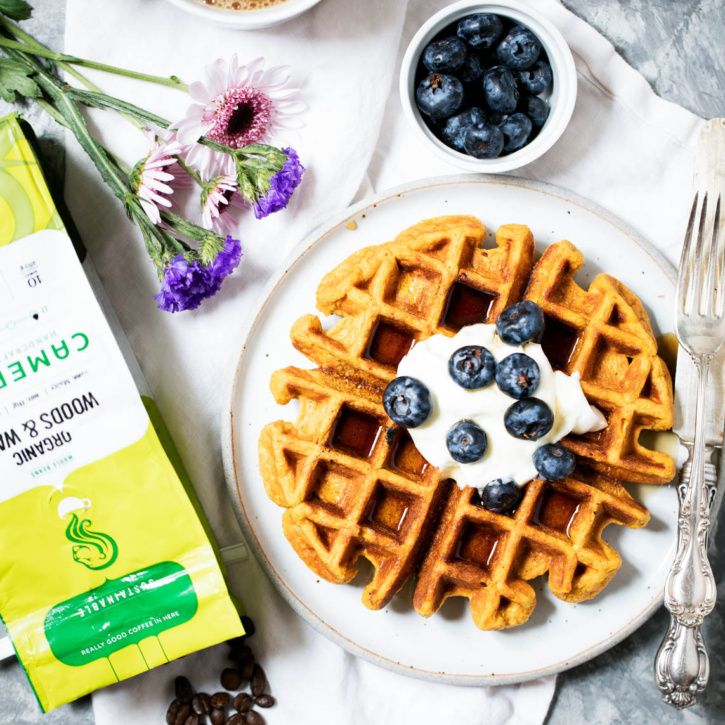 Sweet potato protein waffles made with cottage cheese, oats, roasted sweet potato, a touch of maple syrup and cinnamon! Last week I woke up one morning with a food hangover. Admittedly, I had eaten too much the night before (helloooo pizza!) and woke up feeling a little guilty and a lot bloated. Knowing this all too familiar feeling, I scooted myself to a hot yoga class — not only to release all the salt my body was holding onto from what I had eaten the night before, but also to decompress and remind myself that today is another day, a new opportunity to nourish my body. We all have challenges we face — big or small, but sometimes getting back to your roots and taking a deep breath is all you need for a fresh start. The best remedy I’ve found after a little overindulgence is to move your body and intake high protein, nutrient dense food the next day. After my workout, I came home starving and ready to get back on track with the food that agrees with my body. 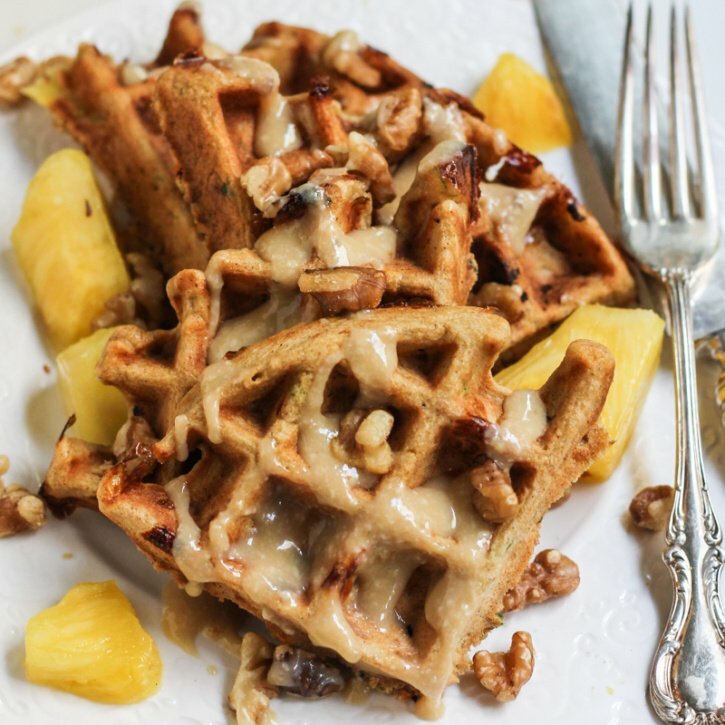 Case in point — these wonderful maple sweet potato protein waffles. 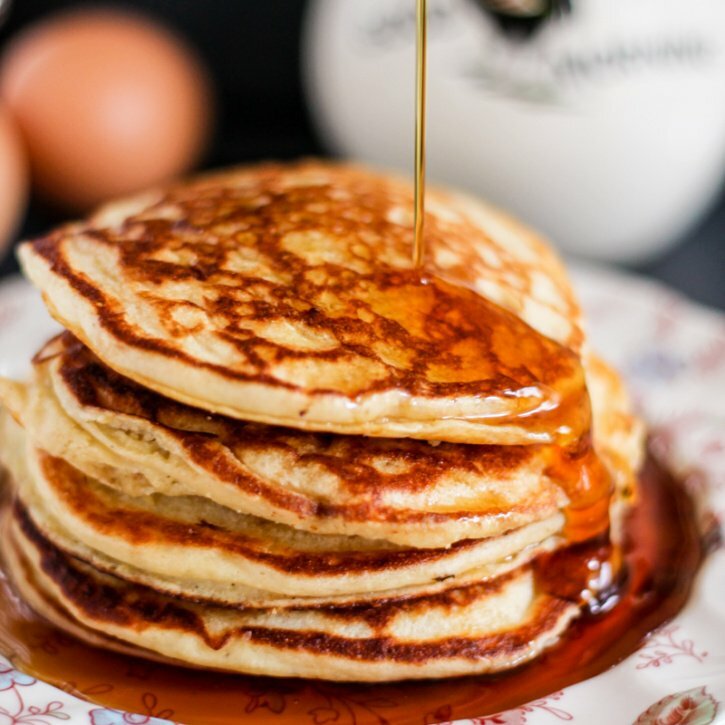 Banana bread pancakes that are perfectly sweet, fluffy and nutritious. Made with whole wheat flour and dairy free too! Safe to say, I’m learning everything there is about being a first-time homeowner. Including when your oven breaks and you have to call the repair man to fix it. Who knew home repairs could be so ridiculously expensive? 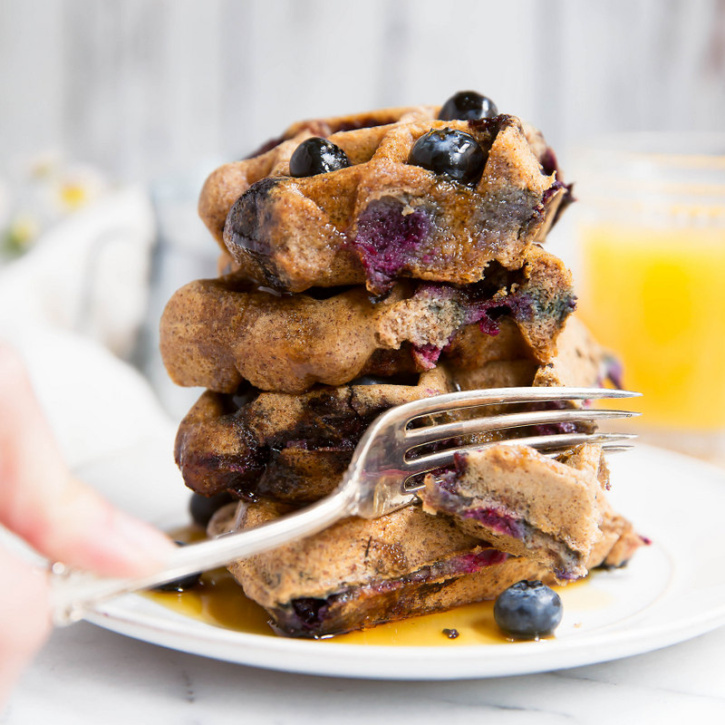 Now that the oven is finally working again, I can get back to meal prep from the Healthy Glow Co. — that means these banana bread pancakes are on the menu this week. Here’s how it goes: Wake up at 5:30. Hit the snooze button for 5 minutes so I can cuddle with Tony. Feed Milly. Brush my teeth. Get dressed. Grab a cup of coffee to go. Kiss Tony on the cheek and walk out the door so I can just make it for my 6am workout class. I enjoy getting my workouts done in the morning because not only does it give me TONS of energy, but then I can focus on work the rest of the day. Since I ususally don’t eat pre-morning workout, my stomach is rumbling once I return home. During my shower, it’s not uncommon for me to debate my breakfast options for a good 10 minutes. Do I want avocado toast with ALL the toppings?! What about pancakes? Maybe a green smoothie with peanut butter? Perfectly fried eggs? Crispy, fresh waffles? UGH. So hungry I can’t think. 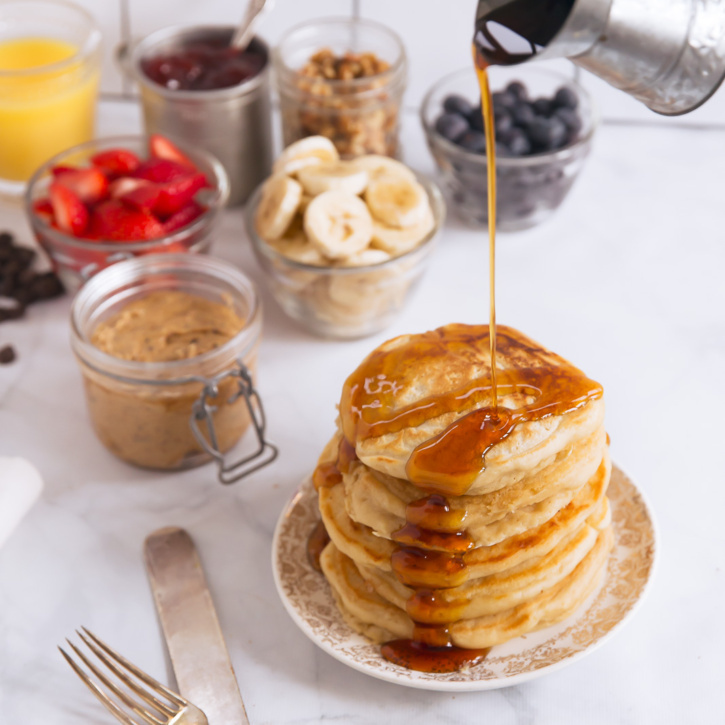 When I think of weekend breakfasts, pancakes are always top of mind. How about you? There’s nothing like a stack of fluffy cakes to say that we made it and accomplished the week, right?! 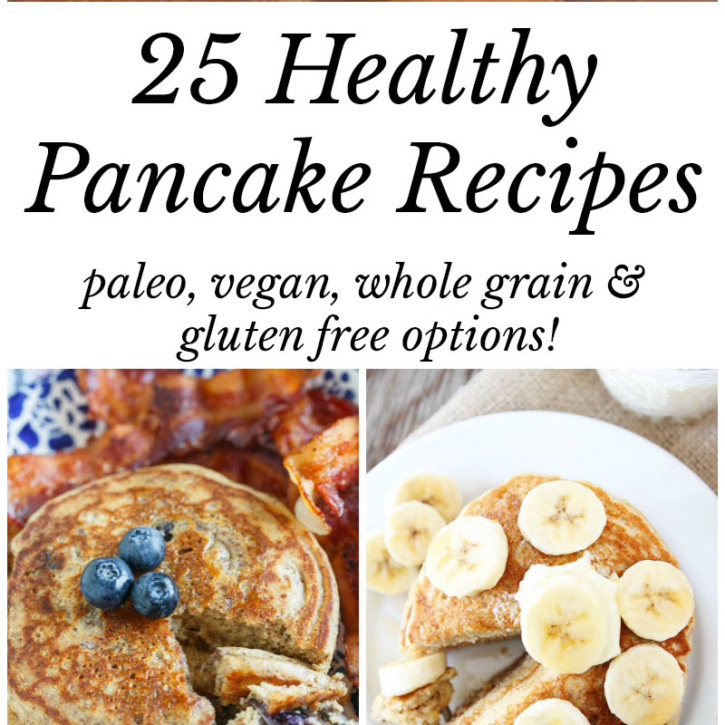 That’s why I put together a list of my favorite HEALTHY pancake recipes — some are gluten free, some whole grain, a few paleo; most importantly, they’re all deliciously stackable. Ready to dive in? Let’s do it. 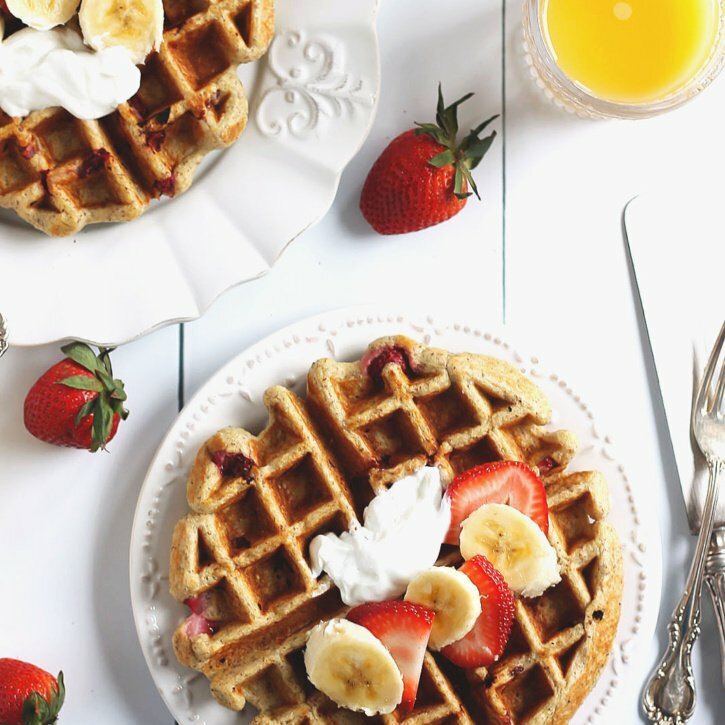 If you happen to go out for New Year’s Eve, then you know the day after ALWAYS involves a delicious breakfast. 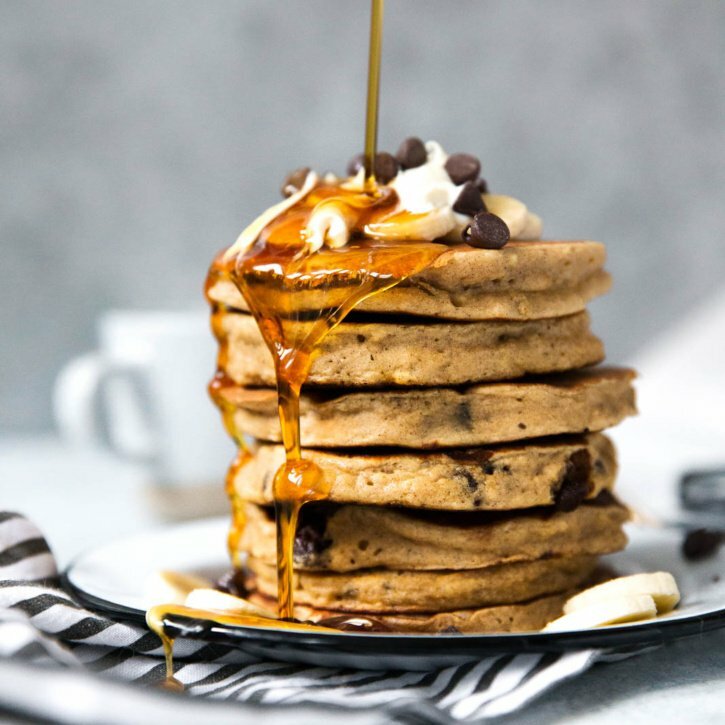 My latest addiction just so happens to be PANCAKES, and I thought what could be cuter than a pancake bar for those lazy mornings. Or if you’re a mom, something fun and delicious to impress the kids. 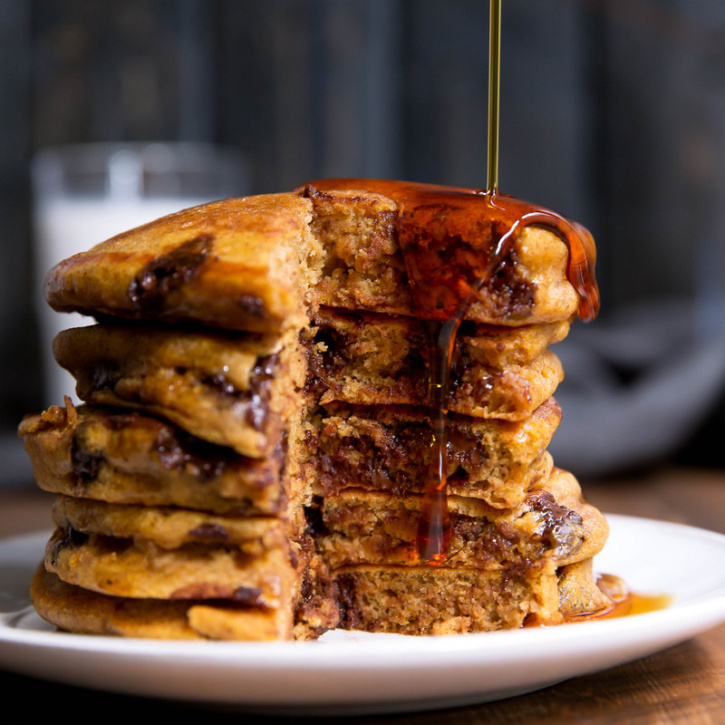 Fluffy whole wheat pumpkin chocolate chip pancakes. These healthy cakes are perfectly spiced and a wonderful breakfast treat. So The Leftovers is back on HBO and I’m still utterly confused as to what’s happening. I actually have no idea why I’m still tuning in. Quite frankly, it may be strictly for a glimpse of Justin Theroux. Just sayin’. There aren’t many other shows I’ve been keeping up with because I can’t seem to get into any. I’ve already watched Bloodline, Breaking Bad, House of Cards, Bates Motel and The Vampire Diaries (don’t judge me on that one). What I’m really waiting for is a return of Game of Thrones or The Americans. Or maybe they’ll just put Dawson’s Creek and Felicity both on Netflix? Everyone knows that throwbacks are truly the best. 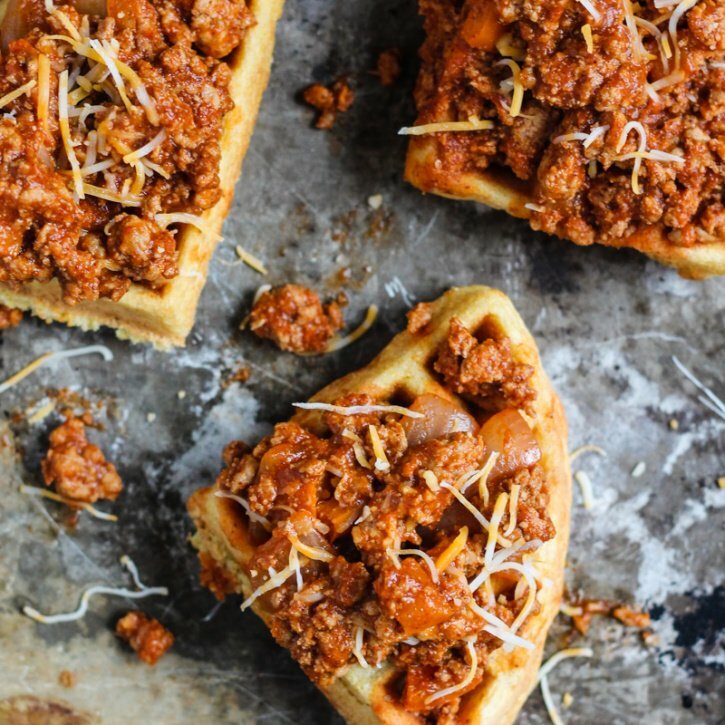 My first memories of waffles are the ones from the local breakfast spot on Sundays after church. They were gigantic, crispy on the outside and topped with real whipped cream. A true breakfast indulgence that’s especially wonderful when you’re a kid. Now that I’m older, my eating habits have changed somewhat. I mostly seek recipes that that fill me up with fiber, protein and healthy fats. Typically I go for a hearty breakfast of eggs, turkey bacon, a banana and any kind of nut butter I can find in my cupboard. However, there are days when I get cravings for a waffle the size of my face and just have to give in. Oh hi! I have to confess that my usual breakfasts don’t consist of pancakes or anything quite special. Typically I’ll fry an egg or two, or enjoy an on the go protein shake. FLASHBACK to my glittery college years: I remember sitting down with a bowl of oatmeal or a peanut butter and strawberry jelly toasted English muffin and enjoying breakfast while reading in our college breakfast nook. I’d soak in the flavors for a good 30 minutes because at that point in my life, breakfast was a time I cherished. For some reason I’ve been craving those incredibly long breakfast mornings again; mostly I want to recommit to making enjoyable, nutritious and creative morning meals – even if I’m the only one eating it. I find that when I take the time to prepare something, it somehow feels more satisfying and filling.